Nope! All the battles happen like this. Which is a good thing, if you think about it - if we alter the myth by killing the main Orlanthi god, that'd cause some incredibly unpredictable things to happen. Bad things. Things the game isn't really set up to emulate in the first place. 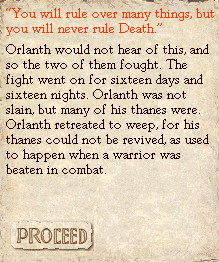 Orlanth comes back and treats Harvar like a cottar. "You are a stranger," he says, "yet I will extend to you some of the protections of my clan. You will serve me, and in return you shall have safety and shelter. As your king, I command you to give me that sword." -"Do you mistake me for a sheep-herding boy?" -"Give me a gift, and I will give you the sword." -Proceed to the next station of the quest. -"Safety and shelter are small things compared to the might of death." 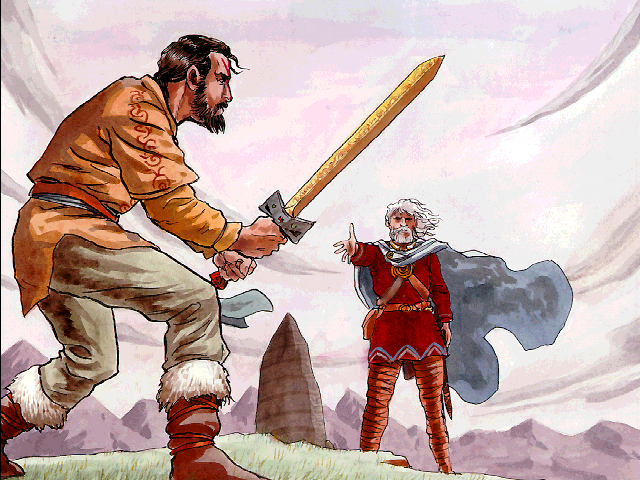 -"The protections of your clan mean nothing; many of your kin will soon die."